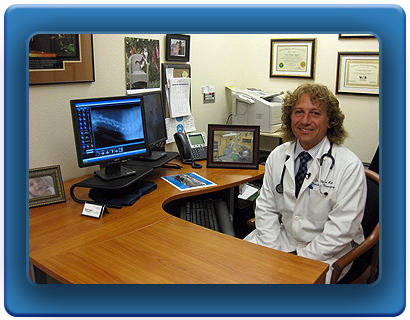 Dr. Filippo Adamo is a Diplomate of the European College of Veterinary Neurology and has been board certified since 1997. In both Europe and the United States, Dr. Adamo has gathered extensive experience in neurology and neurosurgery in academia and private practice. Dr. Adamo served as Clinical Assistant Professor in Neurology at the School of Veterinary Medicine, University of Wisconsin from 2002 through 2007. He has since moved to California where he served as Chief of Neurology at the Bay Area Veterinary Specialists in San Leandro. As Clinical Assistant Professor in Neurology at the University of Wisconsin, he devoted many years of experience in research and clinical neurology and neurosurgery. Dr. Adamo developed an alternative medical treatment for GME (Granulomatous Meningoencephalomyelitis), designed a frameless guided stereotactic CT brain biopsy, investigated alternative medical therapy for brain meningloma in dogs and cats and most recently, developed and tested the first artificial disc implantation for the canine cervical spine geared towards curing Wobbler’s Syndrome. Currently, Dr. Adamo continues to conduct research on artificial cervical disc implantation in dogs suffering from Wobbler Syndrome and cervical disc herniation. His professional interests are brain and cervical spinal surgery. When he manages some free time, he enjoys spending time with his son, playing Brazilian rhythm music and surfing.